Kelugkaat (coarse grass) prepared for drying. Utercimariameng arnait nutaan nangerrluteng. Erniyuunateng ella assiraqan arnait, carangllugnek caliarkameggnek quyurrluteng. Unuakumi tua-i arnat amlleret ayagnaurtut tua-i, ernerpak-llu tayima tua-i, atakuan-llu tua-i tekilluteng nutaan. Yuuciinateng tua-i carangllugnek keggatait ukut caqumaluteng, atmaitnek. Iitaat, cat, kelugkaat, taperrnat, tamakut tamaa-i pitullruit atu'urkateng. Ilait-llu ilututaaqluteng waten tumyarat nunam qaingani, arnat aturturatullrit allamiaqan. Angutet tumyaraqenrilkait, arnat taugaam. Tuaten tua-i ayuqaqluteng uksuarmi, qenuvianun tua-i. 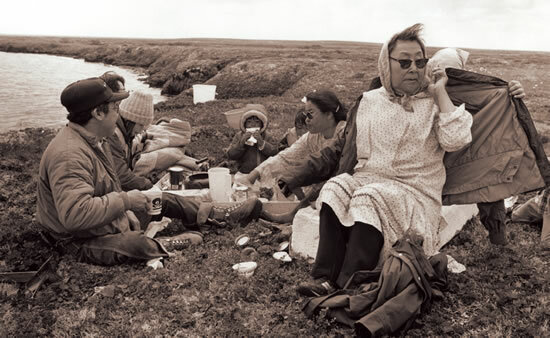 After people returned from fish camps, every day in good weather, women went out and gathered grass that they would work on later. Many women left in the morning and were gone all day. They'd finally come home in the evening. 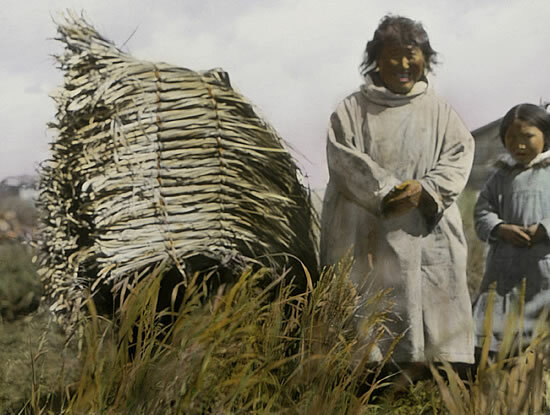 You couldn't tell they were people because their upper bodies were covered with grass they carried. They collected iitaat [tall cottongrass], kelugkaat [coarse grass], taperrnat [coarse seashore grass] that they would use. Some trails that women used year after year were deep. They were trails only used by women and not men. That's what women did during fall until freeze-up. The Andrew and Wasuli families berry picking, Kotlik. Nunam yui qalarulluki cali aviukarqetuluteng. Tauna iqvallerkarteng-llu pisqumaluku, maniitesqelluteng-llu piaqluteng piyukengameggnek. Iqvalrianun-llu maligut'langama tua-i niicugniaqluki tuatnaaqata. They spoke to the land's inhabitants, nunam yui, and gave an offering [of food and water]. They asked that they be presented with berries or things they wanted. When I began accompanying berry pickers, I listened to them when they [gave offerings and asked for things].